As ever, it’s great to be back here at Herbert Smith. You know – I often talk about my time here. My experience here – working with businesses of all sizes – has proved invaluable in my current role as Shadow Business Secretary. It’s also good to speak here during Black History Month. It is worth reflecting that when I started my legal career here in 2002, I was one of just three black fee earners. So I’m pleased to return today to find Herbert Smith has made good progress in increasing the number of black fee earners but there is obviously more room for improvement. And I’m delighted to be speaking to a room full of black City professionals. There was a time when the numbers of black City professionals would barely have filled this room – when we all knew each other so well because there were so few of us. That is no longer the case and that says to me that despite all the obstacles black people have faced, we are making progress. Because I think there’s a powerful desire in this country to live in a society where people have the opportunity to achieve their dreams and aspirations regardless of their background. A social contract: shared responsibilities should mean shared opportunities and shared prosperity. The progress we have made is now deeply embedded in the British psyche. Emile Sande and Tinie Tempah have provided the soundtrack to our lives over the last few of years. Zadie Smith is a regular fixture on our Kindles. The entire country celebrates whenever Mo Farah or Jessica Ennis-Hill cross the finish line. You see, it’s so important that we use Black History Month not only to celebrate those on whose shoulders we stand who broke down the barriers in times past – but also those who are pioneering a new future today. Both are vital to giving our young people the confidence and inspiration to back themselves and go after their ambitions and dreams. One of the reasons is because our broadcast and film media have a tendency to stereotype black people: to present an image of black British people that suggests we can succeed in sport, entertainment and music, but not necessarily in other fields. So, I think we all recognise that though we have made great strides towards a more equal society, we still have a long way to go. As a non-white person in Britain today, you’re twice as likely to be unemployed as a white person. If you are a young black graduate, you’ll earn on average only three quarters of what a white graduate earns. If you have an African-sounding surname, you need to send about twice as many job applications as those with traditional English names – not even to get a job – but just to get an interview. And I’m being generous here. I haven’t gone into the over-representation of black people in the criminal justice and mental health systems - or the disproportionate numbers of young black Caribbean boys, say, being excluded in our schools. If you believe that we are all created equal and ours should be an equal society – then we cannot let up. Our commitment cannot waver. We cannot be complacent. That’s why I’m a proud to be Labour. Over the years it was my party that enshrined non-discrimination as a guiding principle not only of our beliefs, but also of our laws – from the Race Relations Act of 1965 to the 2006 anti-age discrimination regulations. And during our most recent period in office, we did what the previous Conservative government failed to do – to set up the full judicial inquiry into the disgraceful mishandling by the police of the investigation into the murder of Stephen Lawrence, an inquiry that acknowledged formally for the first time what we all knew to be true – that there is institutional racism in our country – and we sought to deal with it. Of course, the real credit for that inquiry belongs to the Lawrence family for their refusal to give up in their demand for justice – and I am proud to say Baroness Doreen Lawrence formally became a Labour peer this month following her nomination by Ed Miliband. That tradition of working to stamp out discrimination in all its forms – deliberate or subconscious – wherever it exists, continues. Just last week our new Shadow Equalities Minister, Gloria De Piero, launched our race equality strategy. We are consulting on it so please visit our website at yourbritain.org.uk and have your say. So I’ve talked about progress made, the need to challenge stereotypes, and the ongoing quest for race equality in Britain. But we must go beyond this. I think we’re unlikely to see future generations of black British people go on and do better than the last if we focus on race inequality alone – we must address issues of class and social mobility which are holding people back as well. Social mobility is an annoyingly dry phrase for something so fundamental to all of us: making possible the basic desire of people to create a better future for themselves and their families. I’ve worked very hard to get to where I have. However, I do believe that I would have had to work even harder had I not come from a middle class background. When I was growing up the black middle class was still in its infancy. But now it is growing. However, unless we make social mobility for everyone our driving purpose, people won’t be able to meet their aspirations, we will not be a more equal society and we won’t make the most of our potential as a country. Britain remains a deeply divided society and economic disadvantage still strongly shapes life’s opportunities. They say there’s a real danger that social mobility could go into reverse in the first part of this century if we don’t act. So our goal is not only to eradicate prejudice in all its forms and reduce racial and other inequalities, but to create a society where if you want to get on, move out of your flat into a house, progress from the shop floor to the board room, we empower you to do it. Because it is in all our interests - it not only creates wealth for the individual, jobs and growth, and of course tax receipts for the Exchequer! But that is not our country today. Social mobility has stalled. As Alan Milburn, chair of the Commission said – over the last few decades we’ve become a wealthier society but we haven’t really become a fairer one. So let me be clear: increasing social mobility and empowering people to meet their aspirations goes to the heart of my politics, it goes to heart of Labour’s values, it goes to the heart of the One Nation Britain Ed Miliband seeks to lead. Neither your race nor your class should stand in the way of opportunity. We sought to increase social mobility in Government, investing heavily in education, Sure Start and thousands of new Children’s Centres just a couple of the measures to help give our children a better start in life, important drivers of life chances. But it wasn’t enough. While we managed to stop income inequality growing, we weren’t able to reverse the massive growth in inequality that happened in the two decades before ‘97. And our achievements during our years in office have since been rolled back. Alan’s report was clear that the government is making the situation worse. Austerity is hitting the poorest hardest. Long-term challenges remain unresolved. Child care quality is too variable; child care costs too high. The most deprived areas still have 30% fewer good schools and not enough state school children are going to the best universities. The number of young people unemployed for more than two years is at a twenty year high. Senior professionals are still more likely to be privately educated and privileged men. Credit where credit is due: the Government deserves praise for setting up the Social Mobility Commission. But the Commission’s report and its sobering conclusions challenge us to have a serious conversation about how we secure a future of opportunity for all. So today, I’m calling on the Government to hold a debate in the House of Commons – on Government time – on that important 2013 report of the Social Mobility and Child Poverty Commission. So what are the kind of things a future Labour Government would do to boost social mobility? On growth, the Commission says Government should aim to achieve a balanced recovery that reduces living costs and improves earnings. We would ensure that those with the broadest shoulders should bear the heaviest burden. So instead of prioritising giving 12,000 people earning millions a tax cut in the order of £100,000 each, we’d give 24 million working people on middle and lower incomes a 10p starting rate of tax. On jobs, the Commission urges the Government to set a goal of eliminating long-term youth unemployment. That’s why we’ll introduce a compulsory jobs guarantee for young people and the long-term unemployed to get people back to work. On training, the Commission urges business leaders and the Government to come together to ensure half of all firms offer apprenticeships. So we’d insist that companies taking up large government contracts deliver apprenticeships and we’d give employers more control over skills funding in return for more apprenticeships. On childcare, the Commission says more should be done to support lower and middle income families with child care costs. So we’d expand free childcare for 3 & 4 year olds from 15 to 25 hours per week for working parents, paid for by an £800m rise in the bank levy. On pay, the Commission urges the Government to focus on reducing in-work poverty by looking again at the remit of the Low Pay Commission to enable raising of the minimum wage and to look at how we incentivise employers to pay more. That is precisely why we have appointed the former Deputy Chair of KPMG, Alan Buckle, to chair a review for us into those very issues. And of course, for our wealth creators and entrepreneurs, I am determined we provide you with proper support to start up, grow and lead a business, one of the most powerful drivers for social mobility. I could go on. These are just a selection of the policy commitments we’ve made that will not only help people with the cost of living but give them the ability to create a better life for themselves and their families – to meet their aspirations. So we must celebrate the progress of black people in every field, and we must tackle the race inequalities that still hold people back. But we must also seek to achieve greater social mobility, to make ours a more equal society and more prosperous nation. For it is vital that everyone should have hope - hope for a better tomorrow, hope to make the most of their potential. It's about having purpose, it's about aspiring and being inspired. Looking to our heroes and looking to our future. And that calls on us to act. 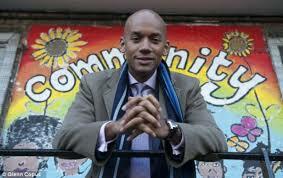 Chuka Umunna is Labour Party MP for Streatham, London. He is also the Shadow Business Secretary.